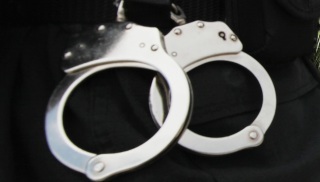 A man who police say was high on PCP stripped his clothes off in a Prince George's County McDonald's and refused to submit to police as they used a stun gun, a baton and pepper spray on him, police say. A seven-minute-long video posted online shows a shirtless man staggering around the McDonald's as police order him dozens of times to hit the ground. The video shows police using a stun gun on the man at least twice, hitting him with an expandable baton and spraying him with pepper spray, which the man simply wipes from his eyes. The incident is shown in a video shot by a witness and posted to LiveLeak.com. WARNING: Many viewers will find it graphic and disturbing. The incident occurred recently in Riverdale Park, Maryland, said Riverdale Park Police Chief David Morris. "The individual was incoherent, hallucinating, dazed confused -- again, behaviors indicative of an individual under the influence of PCP," Morris said, noting officers said the man did not seem to feel pain. "That would have dropped the normal individual, the average individual, to their knees -- it had no effect," Morris said of the man being hit with a baton. A worker at the McDonald's said the man walked in and began to take off his clothes, curse and argue with himself. Workers called 911 as baffled customers stood by. Morris defended officers' use of force to try to subdue the man. "It was a violent situation," he said. "The officers exercised, I believe, considerable restraint." They eventually were able to detain the man and take him to a hospital. Doctors confirmed that the man had used PCP, police said. Officers said they could smell the drug. "Imagine a very, very strong [odor] of ether, which is a primary chemical used in producing PCP," Morris said. Marcus Anthony Moratelli was arrested. Police said he has a criminal history that includes drug charges. McDonald's said in a statement that customer safety is a priority and the company is cooperating with police.